It used to be that the word ‘desert’ conjured up images of a desolate flat land with nothing but sand as far as the eye could see. 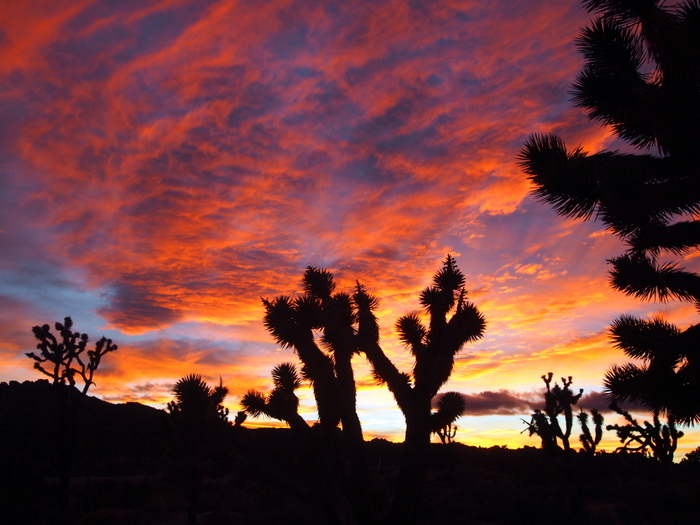 After the past week and half in the Lake Mead area and now here in the Mojave Desert, I realize just how wrong I was. 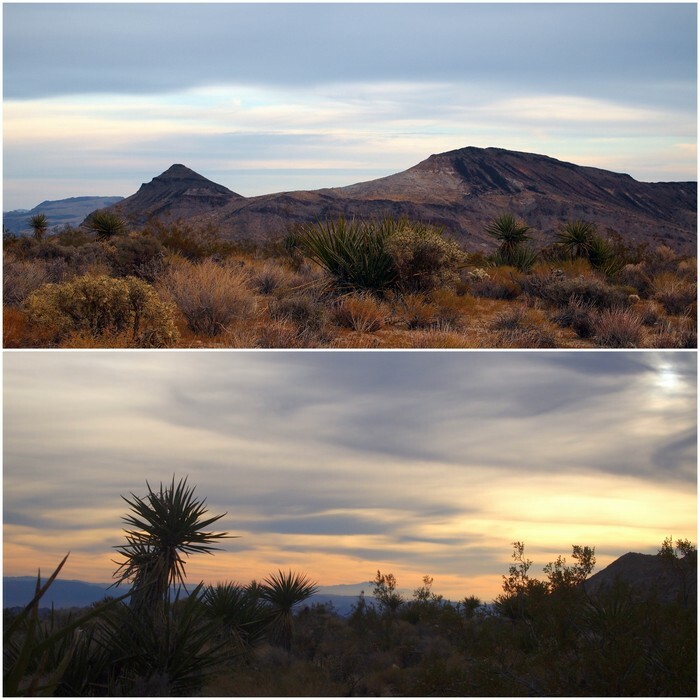 The Mojave National Preserve landscape may be vast and void of most human activity, but it is also diverse, fascinating, and filled with thrilling geologic wonders. 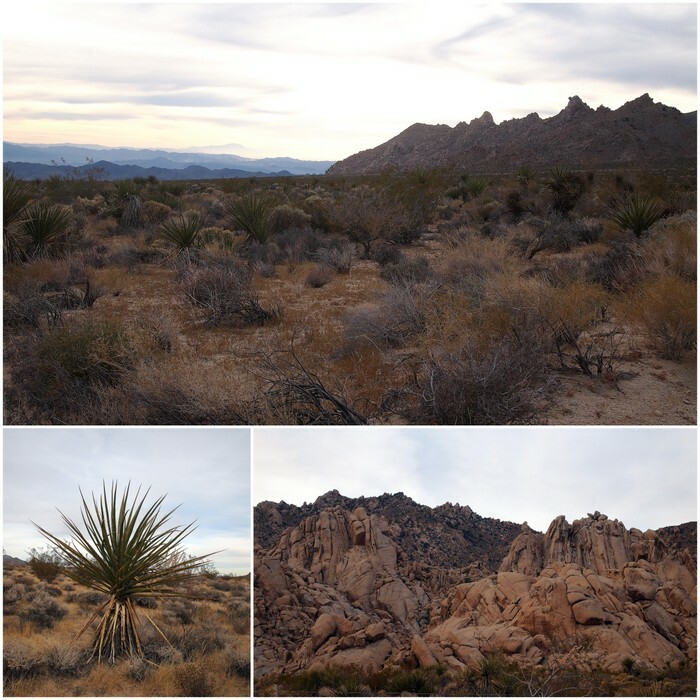 There are craggy granite mountain tops, volcanic cinder cones, meadows dotted with prickly cactus and spiky yuccas, forests dense with evergreens and funky shaped Joshua trees…and yes, there is sand. Huge mountains of sand piled high by the wind and sculpted into peaks and ridges that capture the eye and tire the legs. All this variety makes the desert far less desolate and far more wonderful than I could have ever imagined. 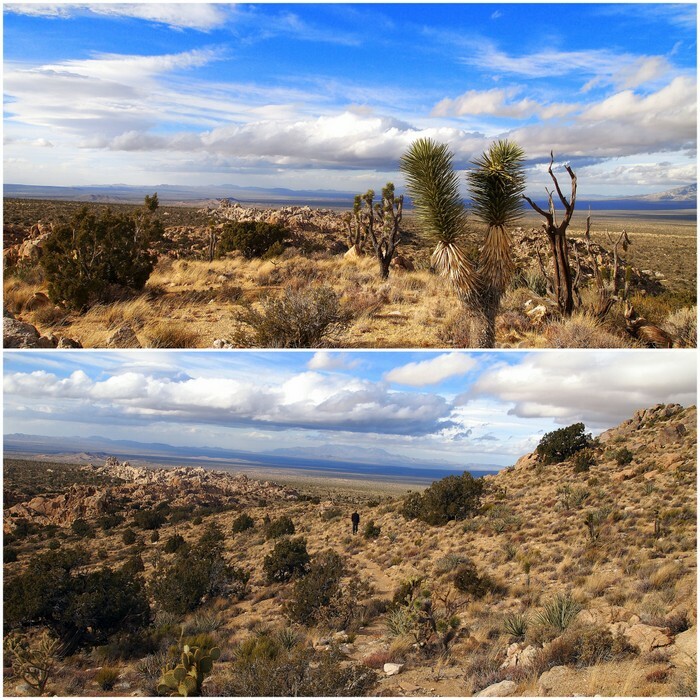 Our first stop in the Mojave was at a roadside camping spot on the edge of the Cima Dome, home to one of the world’s largest and densest populations of Joshua Trees. 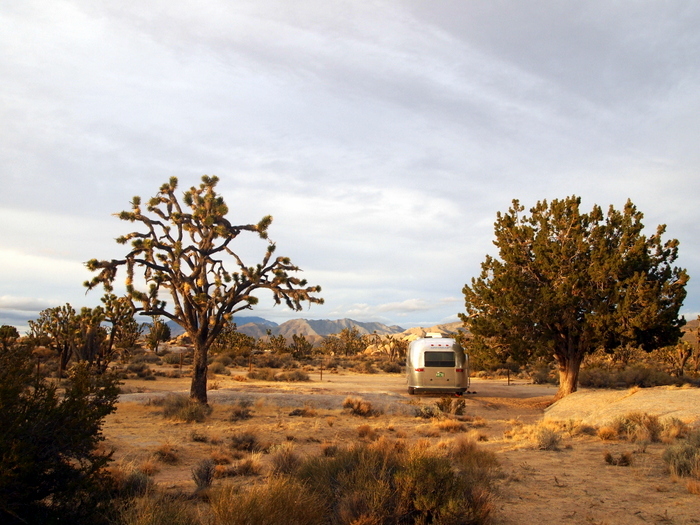 The park offers two developed campgrounds with a minimal fee of only $12 /night, but they also permit what they call “roadside camping” in a number of different areas. The park service website offers a list of existing roadside camp spots with good directions and descriptions of each place. In addition to those listed, there are many, many dirt roads winding through the desert with more camping opportunities. The main guideline stressed by the park for dispersed camping is to set up camp only in places where there is evidence others have camped before. 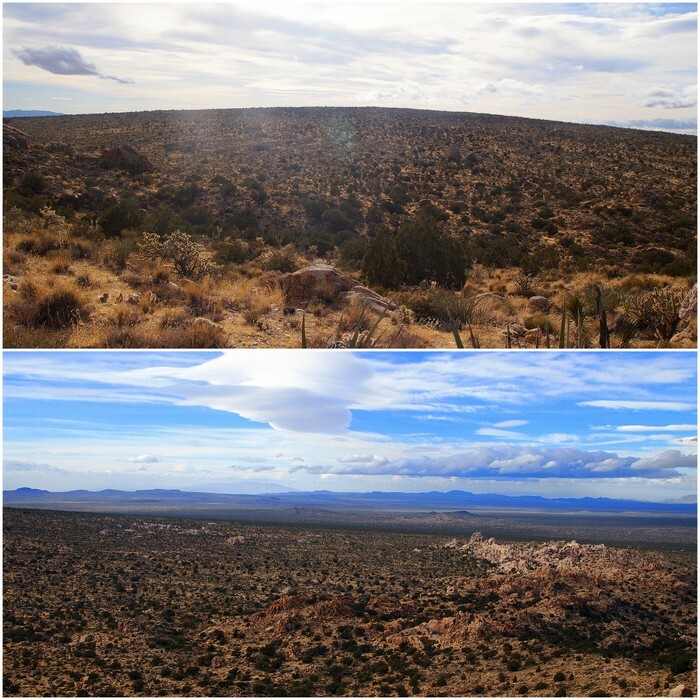 This minimizes further impact on the vegetation and helps keep the preserve preserved. Makes sense. Since traveling in the Airstream limits where we can go, and we’re always worried about driving down a road then not begin able to turn around, we decided to stick with one of the spots listed by the park service. It turned out to be an excellent choice. We easily found the pull-off loop on Cima Road right near the entrance to the Teutonia Peak trail. The dirt road loop had two spots with stone fire rings where it was obvious that others had camped before. While not far off the main road, it felt private enough and only a very small number of cars passed by each day. 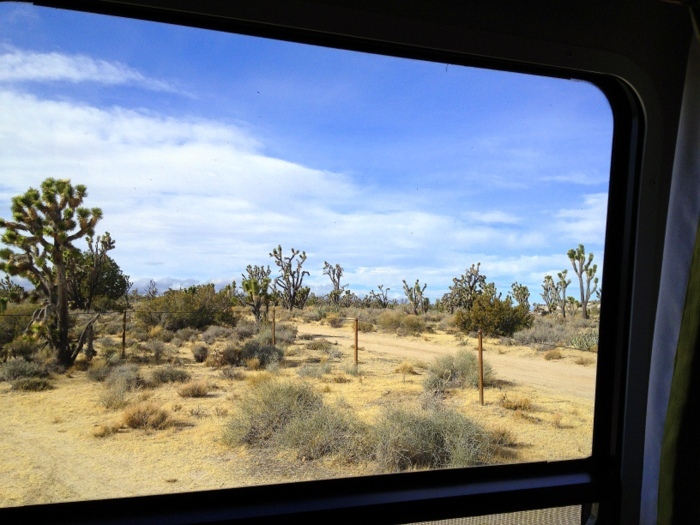 The best part was the Joshua Tree forest right out our door. This uniquely shaped plant is actually not a true tree, but instead a species of Yucca. 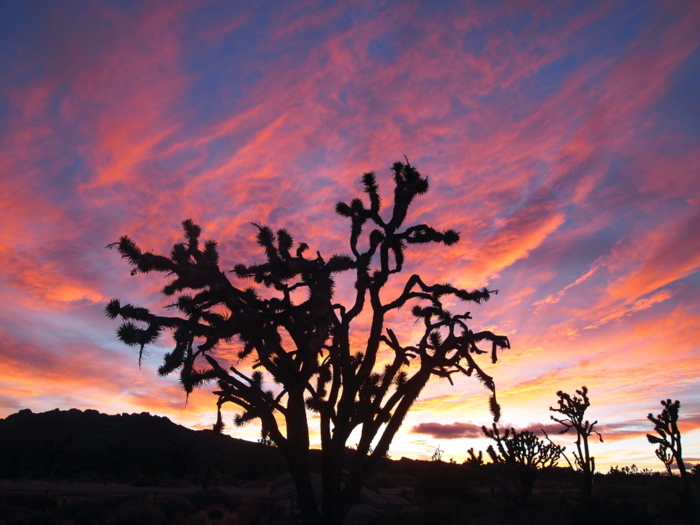 The name originates from a group of Mormon pioneers who came upon this ‘tree’ as they crossed the Mojave Desert. They named it the Joshua Tree because it mimicked the biblical prophet Joshua reaching his arms to the sky and waving them toward the promise land. Hmm…not sure I see waving arms in this funky shaped tree, but somehow the name stuck. 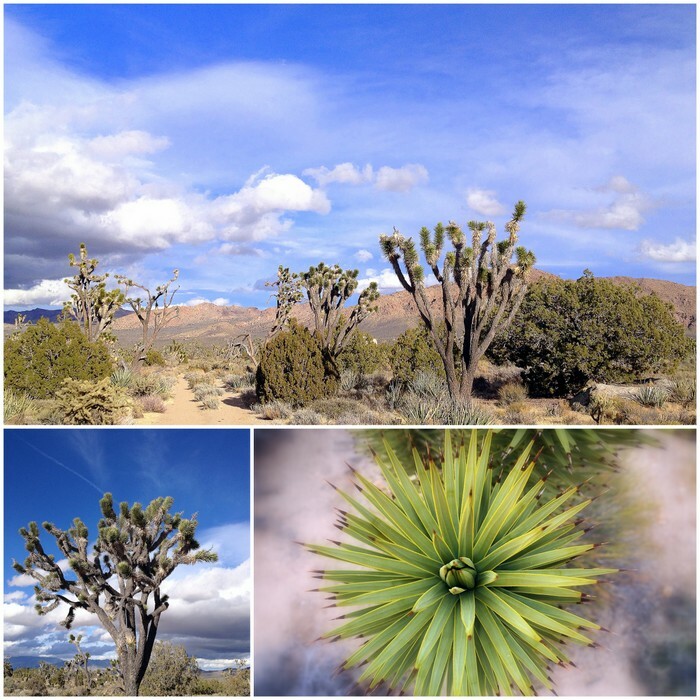 Tree, plant, yucca, biblical prophet- whatever you want to call them they’re a pretty cool looking addition to the desert landscape. 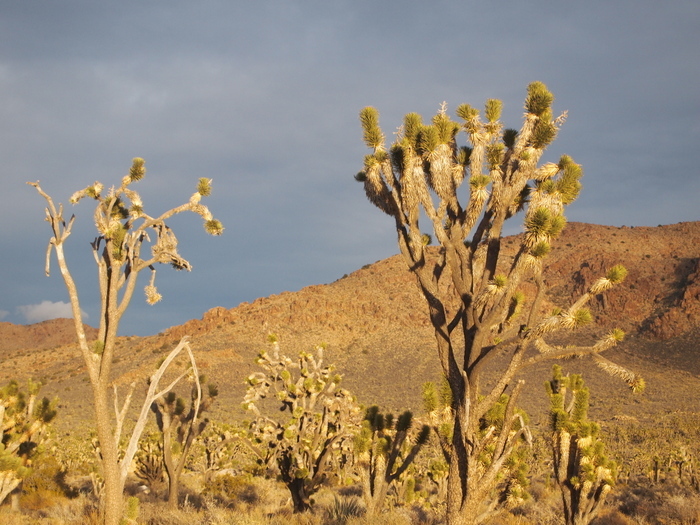 This particular Joshua Tree forest is unique not only for its size and density, but also for its location atop the Cima Dome. A nearly symmetrical volcanic dome that rises 1,500 feet above the desert below, this one of a kind geologic feature also happens to be the perfect environment for Joshua Trees. Our campsite was near the edge of the dome and until we climbed up nearby Teutonia Peak we couldn’t actually see the dome shape. While it boasted awesome views and hiking, the site on Cima Rd. was severely lacking in connectivity so we limited our stay to just two nights. Even with our external amp we only got a very weak Verizon signal, so weak in fact that it was useless. Not even the tiniest bit of AT&T at the site, but we were able to pick up 4 bars of 4G at the top of the peak so we got in a little Internet time up there. Our next stop was the Kelso Dunes where we wanted to hike the dunes and also check out the roadside campsites in the area. We first stopped at the dunes trail-head and were delighted to find a strong Verizon signal. So we proceed a quarter mile down the road to one of the campsites. Unfortunately, we must have driven just out of range because after parking and leveling we discovered that the signal had disappeared. What a tease. It was a nice spot to stop for lunch though and after eating we left the airstream at the campsite while we set out for a hike. 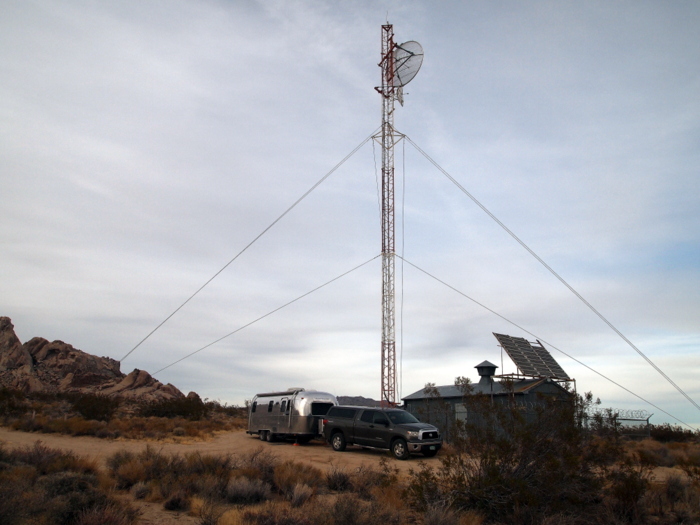 2015 Update: We recently learned from other RVers that the cell signal at the dune camping area has improved. Hoping to make back there and see for ourselves one day. 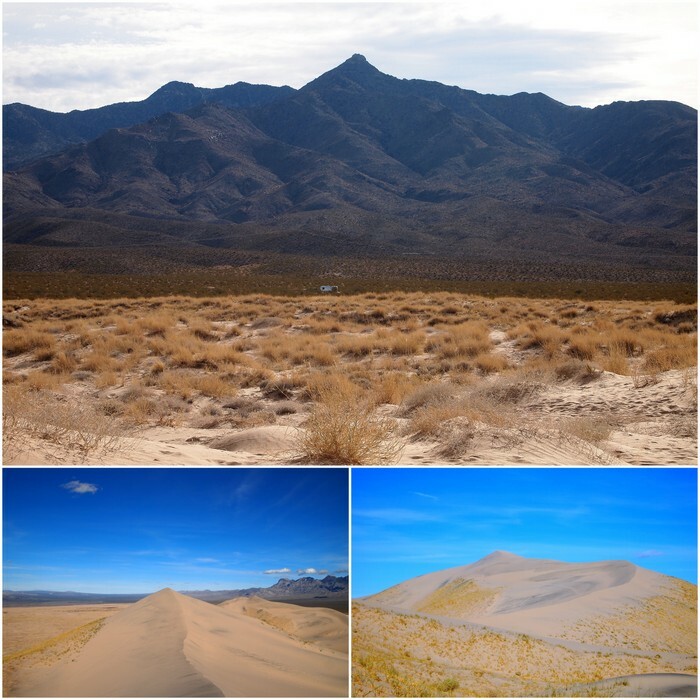 Most of the sand has traveled all the way from the Mojave River sink east of Afton Canyon. Wind blowing from the northwest gradually carried the sand southeastward. In the path of the prevailing winds lie the Providence Mountains and the pink pinnacles of the Granite Mountains. The rocky crags and sloping fans of the two ranges block the moving sand. 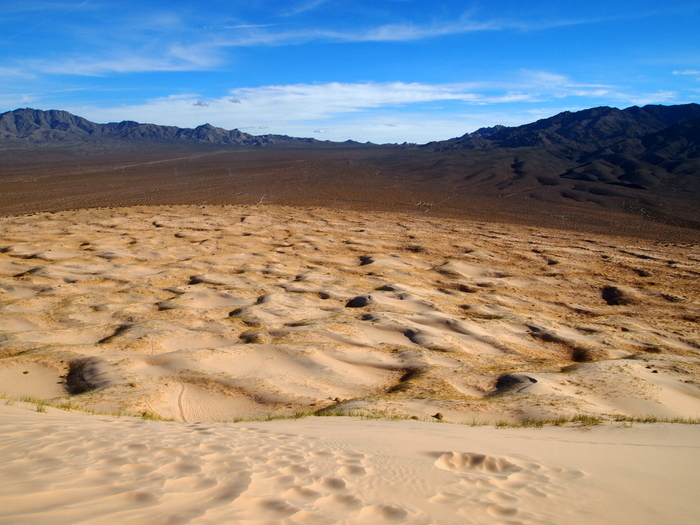 Sand piles up at the base of the mountains and along their flanks, forming dunes and sand sheets. 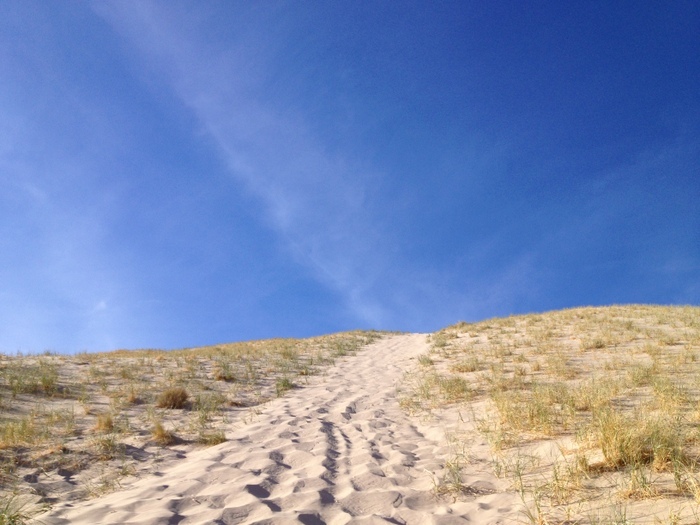 The hike to the top of the dunes was short but strenuous. Soft loose sand made the going tough and near the end when we climbed the steepest part it felt like you were sliding backwards two steps for every step you took forward. We made it though, and the reward at the end was more than worth the effort. 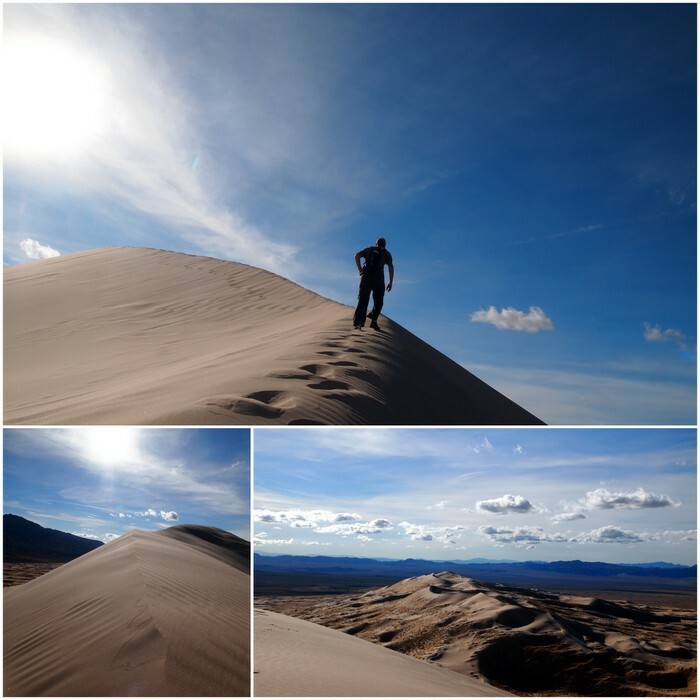 The Kelso Dunes are known for a phenomenon called “booming dunes” which occurs when the sand slides down the dunes and emits a low frequency rumble. We learned at the visitor center that by pushing the sand down the dunes we could make this phenomenon occur. After a little trial and error we discovered the easiest way to produce the sound was by slowly sliding down the steepest part of the dunes and listening to the rumble that followed. The dune hike was great but it was time to move on in search of some Internet. Fellow airstreamers Leigh and Brian had mentioned a place they found not too far from the dunes with a strong signal and an easy place to turn around. Sounds perfect. This spot also happens to be under a radio tower of some sort which makes for kind of a funny view. We are right near the edge of the Granite Mountains and the views looking away from the tower are incredible. 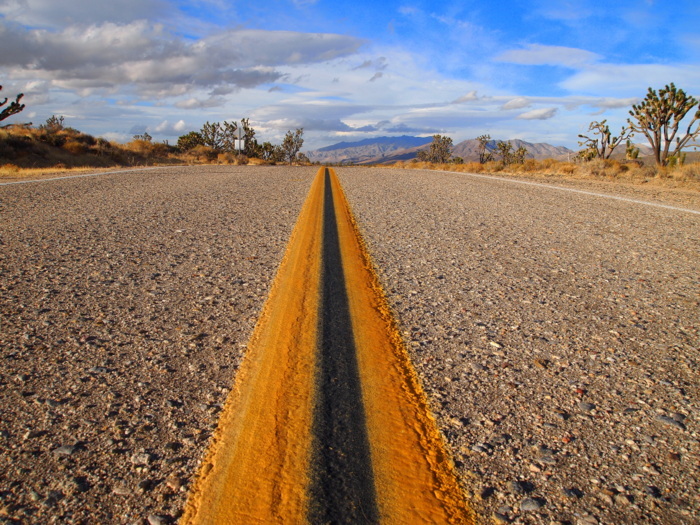 It’s been an awesome adventure here in the Mojave. The park is huge and we definitely still have some areas to explore the next time we visit. It’s time to head down the road though and tomorrow morning we will depart for Desert Hot Springs where we have campground reservations for the next week and half. What a great round-up of the place! This is one spot we have yet to visit in detail. LOVE the sunset shot and the links to the roadside camping. 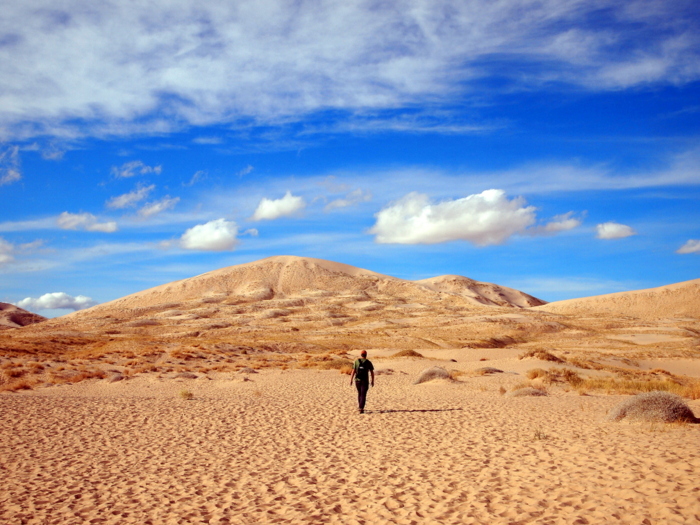 Nina, there are endless opportunities for exploration in the Mojave. We can’t wait to go back and check out some of the spots we didn’t visit this time around. The dunes are pretty special. We did explore the nearby area including a visit to Kelso Depot. 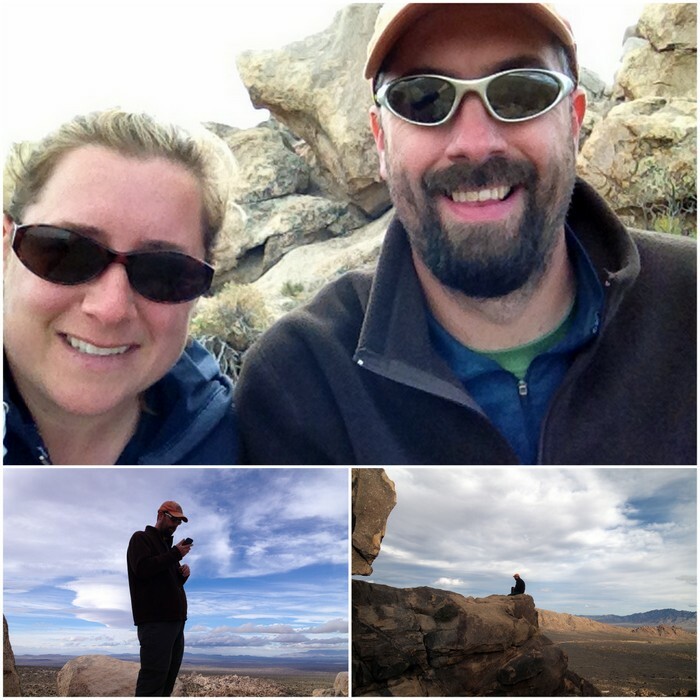 This year we returned to the Mojave NP and stayed near the Hole in the Wall Campground and enjoyed a few hikes over there. We also stayed at Afton Canyon a few years ago and would love to go back someday. 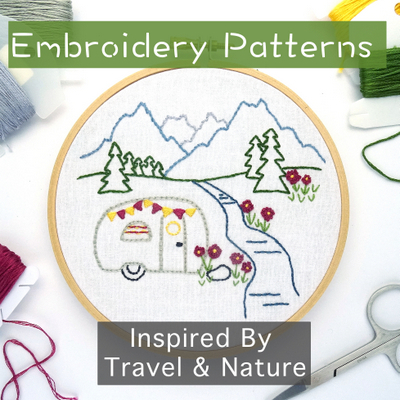 As far as the internet goes, I wouldn’t say that we’re “paranoid” about it, but since this is our normal life (we live full-time in our RV) and work from the road we need to stay connected at all times. It can be limiting sometimes, but since we’re not retired (or independently wealthy) it’s a sacrifice we are willing to make.